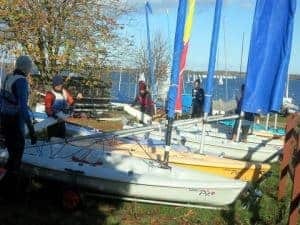 Cambridge Dinghy Sailing caters for people who do not have the time for Team Racing, but still want to sail and race dinghies while at Cambridge. We welcome sailors of any ability, and run beginner and more advanced tuition to RYA training standards – plus fleet racing for sailors with suitable experience. In addition, membership also entitles dinghy sailors to participate in all the activities of the Windsurfing and Kitesurfing sections! Cambridge Dinghy Sailing shares the Club’s Fireflies with the Team Racers. In addition, we hire boats such as Fevas and Laser 2000’s from Grafham Water SC – our home base. We also have access to plenty of wetsuits and buoyancy aids. To get involved, find us at the Freshers Fair, or use the form on our Get In Touch page to register your interest. Each Michaelmas term Cambridge Dinghy Sailing runs an RYA Level 1 training course for up to 12 novices. The course runs on two successive Sundays towards the end of October and is taught by RYA-certified instructors. 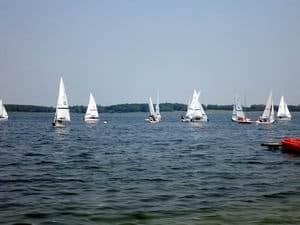 It represents an exceptional opportunity to acquire basic dinghy sailing skills or brush up existing skills. The two days of training ensure that participants have a solid grounding in rigging a single-handed dinghy and sailing confidently in light to moderate winds. You can book online at our RYA Level 1 training page. The course also teaches fundamental sailing skills such as wind direction awareness and boat handling essentials. Participants who pass the end-of-course assessment get an internationally-recognised RYA Level 1 certificate. That enable them to progress to higher levels of skill and qualification with the Club or at any RYA-recognised dinghy sailing centre. What Happens After Basic Training? If there is sufficient interest (at least 6 people) we run an RYA Level 2 training course in November. The RYA level 2 is a sailor’s basic driving license. Over two Sundays it consolidates the skills learnt on Level 1 and pushes them further. On completion of an RYA Level 2 course a sailor will be able to rig most basic dinghies and sail competently and confidently in moderate conditions. We also run general sailing and racing sessions, encouraging people to race because that is the surest way of them steadily increasing their dinghy sailing skills. The sessions are advertised by email – as are RYA Training courses. If you have not registered with us (or joined the Club), use the form on the Get In Touch page to indicate your interest. Membership of the club costs £50 a year – and £5 a trip for petrol money. The RYA Level 1 Training Course costs around £65 for members, around £85 for non-members – and £10 is refunded if they join the Club. The cost of the Level 2 course depends on whether the Club’s Fireflies are available or are being used for team racing training. All of this amounts to value for money that is ridiculously good in comparison to sailing opportunities anywhere else. To experience what sailing at Grafham is really like, sign up for a Taster Session (first weekend of Michaelmas Term) on our Book A Taster page. Alternatively, you can join now on our Join The Club page. Do Dinghy Sailors Have a Social Life? You bet. Apart from the fun of sailing together, we have regular socials and swaps. Because of their situation, Dinghy Sailors are as at home with Windsurfers as they are with Team Racers. The biggest fun is the Tuesday of May Week, when the legendary Cuppers inter-college Sailing and Windsurfing Championship plus BBQ takes place. A new members race is also held around that time – usually just before the May Bumps start.